At this year's annual autoshow in Montréal, Volkswagen Canada took the wraps off of the latest version of the Beetle Convertible. The limited-edition "Denim" model will arrive at dealerships this spring and harkens back to a very special model from the 1970's. Back then, Volkswagen had a "jeans" model in the lineup; one that featured the popular fabric covering the seats. This time around, Volkswagen has taken this a few steps further. With a 170 hp engine, and a one-touch, fully-automatic convertible roof that can be lowered in less than 10 seconds, the Beetle Convertible is already a sun-worshipper's dream…and with the "Denim" package, it is more stylish and comfortable than ever. The look of the car is highlighted by a top finished in material made not only to capture the look of denim, but also mimic the hard-working nature of the fabric as it keeps out the ravages of Canadian weather. The two-tone interior carries on the theme and even features seatback pockets that look just like your favourite pair of jeans…right down to the red tab. Light blue cloth inserts contrast the dark blue of the bolsters and surrounds. White piping finishes it all off, and the sport seats are as comfortable as they look. A colour coordinated "Blue Brushed" dashboard, dark blue denim cloth door inserts and dark blue armrests make this car a real fashion statement. 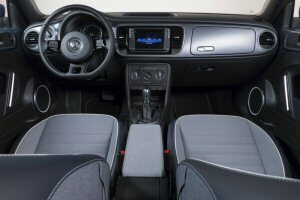 The 2016 Beetle Denim Convertible will be arriving this spring at an MSRP of $29,350. The only decision to make is the exterior colour. "Pure White" will be a popular choice, while the other available hue, "Stonewashed Blue Metallic", will likely make up the bulk of the orders.